1.Pinyin, also called Hanyu Pinyin,which means “phonetic notation” or “phonetic symbols” while Pin means “spell(ing)” and Yin means “sound(s)”. Pinyin is a romanization and not an anglicization; it makes use of Roman letters to represent sounds in Standard Mandarin.Pinyin is most commonly used in Mainland China for teaching school children to read. 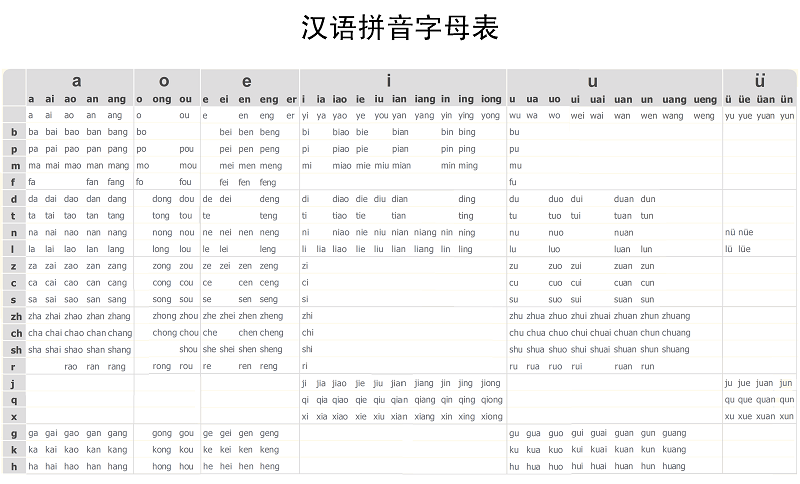 It is necessary to learn all the sounds of Pinyin. It provides a way to read and write Chinese without using Chinese characters – a major hurdle for most people who want to learn Mandarin. Pinyin offer the basics for anyone trying to learn Mandarin and Mandarin pronunciation.This will allow you to learn Mandarin more easily. It looks familiar. However be careful that the individual sounds of Pinyin are not always the same as English. For example, ‘c’ in Pinyin is pronounced like the ‘ts’ in ‘bits’. Here’s an example of Pinyin: Da jia hao. This means “Hi everyone” and is the sound of these three Chinese characters: 大家好. 2.There are 26 letters in Chinese Pinyin as follow : ɑ, o, e, i, u, ǖ, b, p, m, f, d, t, n, l, ɡ, k, h, j, q, x, z, c, s, r, y, w.
Know the Pinyin system, remember each vowel / consonant, and master the sounds by heart.Spend lots of time on practicing until you can memorize and pronounce each sound properly. Trust me, that will save you a lot of time in the long run. One of the good methods to learn pinyin is by listening to songs or lyrics. There is a pinyin song with lyrics that almost every kid knows in China, and it is definitely a easier and quicker way to remember and learn Pinyin. 3.Understand Chinese tones, know the four tones,the four Mandarin tones are used for clarifying the meaning of words. They are indicated in Pinyin with either numbers or tone marks: If you use the wrong tones, your listeners may not be able to understand you. Fourth tone ( \ ): the voice starts at the top, then falls away. Here is the Mandarin version of “hello” written with tones marks: nǐ hǎo or ni3 hao3.